TAIPEI, Taiwan (BRAIN) – There is little doubt that 2016 was a rough year for Taiwan's cycling industry. 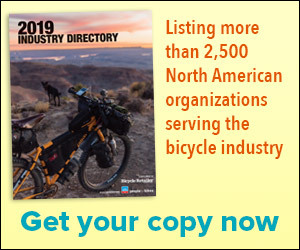 Complete bike exports decreased just over 26 percent by volume, from 3.9 million units in 2015 to 2.94 million in 2016, and fell nearly 22 percent by value last year compared with 2015. TAIPEI, Taiwan (BRAIN) – Since being added to the Taipei Cycle Show in 2012, the d&i awards have recognized innovating design from all corners of the industry, including products in four categories. LONGMONT, Colo. (BRAIN) — Bike-n-Hike, a Trek dealer in this Front Range city, will close its doors after 44 years in business. Current owners Rick and Jill Emerson bought the shop in 2007 from its second owner, Dave Swenson. BLOOMINGTON, Minn. (BRAIN) — According to QBP founder Steve Flagg, the first winter gathering at QBP's headquarters, at the time a much more modest facility, took place in 1988. POMONA, Calif. (BRAIN) — Coates Cyclery, one of Southern California's oldest bike shops, will close its doors by the end of February. MADISON, Wis. (BRAIN) — When industry veteran Tim Staton purchased his first cargo bike, a Larry vs. Harry Bullitt, a few years ago, he had no idea his career path was about to change. SAN FRANCISCO (BRAIN) — When American Cyclery Too's lease expired earlier this year, owner Bradley Woehl decided not to renew. BENTONVILLE, Ark. (BRAIN) — Hundreds of industry representatives, from local, regional and national trail advocates and ambassadors to media and CEOs, from all over the country are gathering in Bentonville, located in Arkansas' Ozark mountains, this week for three days to share stories and plan the future of mountain biking.